Sjiem Fat & Co was founded in the 1950’s by Paul Valentijn Sjiem Fat. Born in Surinam in 1924, Paul Sjiem Fat moved to Curacao when he was a teenager. 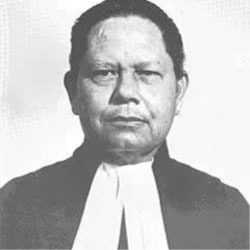 He obtained a law degree in Curacao in 1950 and moved to Aruba where he went into private practice. In 1959 he obtained an LLM in Dutch Law from the University of Utrecht in the Netherlands. In 1986 he obtained a PhD or Doctorate in Dutch Law for his thesis “Biba Willem Sassen” from the Catholic University of Brabant. Paul Sjiem Fat practiced law in Aruba and the Netherlands Antilles for over 40 years. He is the author of numerous scholarly articles and publications and was the founder and editor in chief of the Netherlands Antilles law review JUSTICIA, which later became known as TAR Justicia and is currently published as CARIBISCH JURISTENBLAD. For many years, Paul Sjiem Fat was the President of the Bar Association of the Netherlands Antilles and of the Aruba Bar Association. Towards the end of his career Paul Sjiem Fat was knighted by the Queen of the Netherlands, who made him an Officer in the Order of Oranje Nassau. In 1977 Johan Sjiem Fat joined the firm and practiced together with his father for 15 years. After Paul Sjiem Fat retired in 1992, Johan Sjiem Fat took over the firm, which he now manages. Recently Gabriela Sjiem Fat has also joined the team of lawyers at Sjiem Fat & Co.